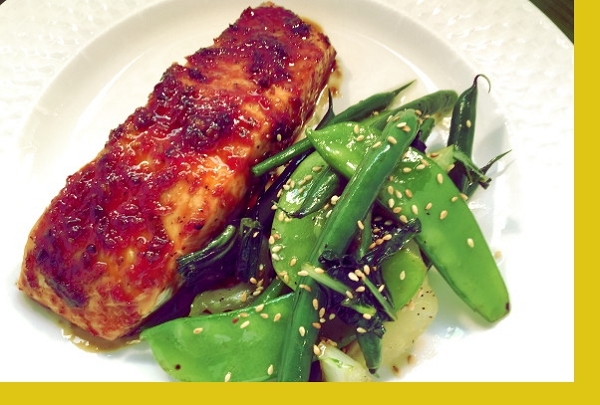 Moist, juicy and fresh oven baked salmon in a delicious made from scratch teriyaki glaze served with a healthy vegetable stir fry of bok choy, green beans and snap peas. Salmon: Preheat oven to 400F. Place salmon in provided pan. Pour Teriyaki glaze over salmon. Bake uncovered for 15-20 mins to desired doneness. Vegetables: Coat a skillet with oil and heat on med-high heat. Saute green beans for 3 mins. Add bok choy. Saute for 2 mins. Add snap peas. Saute for 2 mins. Add vegetable dressing. Toss for 1-2 mins to desired tenderness. Remove, top with sesame seeds and serve. I'm really impressed with the variety and complexity of flavors in Maria's dishes. The salmon was delicious. I haven't been to my usual restaurants in about two months, because I have Maria to help me do it better at home. Thanks Maria!!! 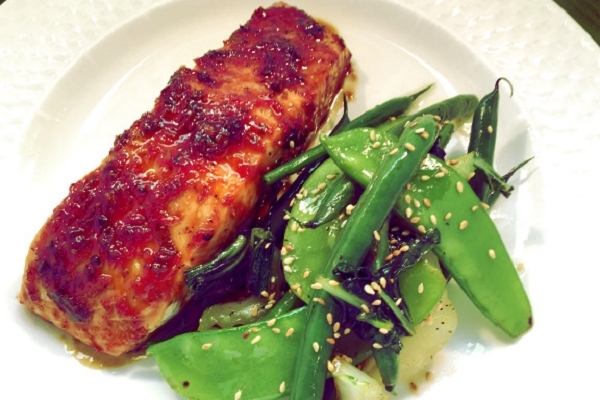 The glaze on this salmon is delicious...you don't need any other seasonings. We also love the vegetables / seasoning. Just an excellent healthy dinner for fish lovers. We love the bok choy and snap peas that come with it. One of our regular orders! Thank you Maria. I love this dish! I order it every time. Mom stated that this was the best Salmon she has eaten since leaving Maryland! We have enjoyed all of your meals. The salmon seems to be our favorite. This was very good. I usually have to be in the mood for fish, but after the first bite I was ready to eat all of it. The vegetables were fresh and the sesame seeds just made them even better! My husband and I are so happy to have tried this new meal on Maria's menu. It was just fantastic. Fresh salmon, with very tasty sauce and healthy vegetable that the meal came with. Cooking time: 15/20 minutes. Price: so reasonable! Thank you Maria.